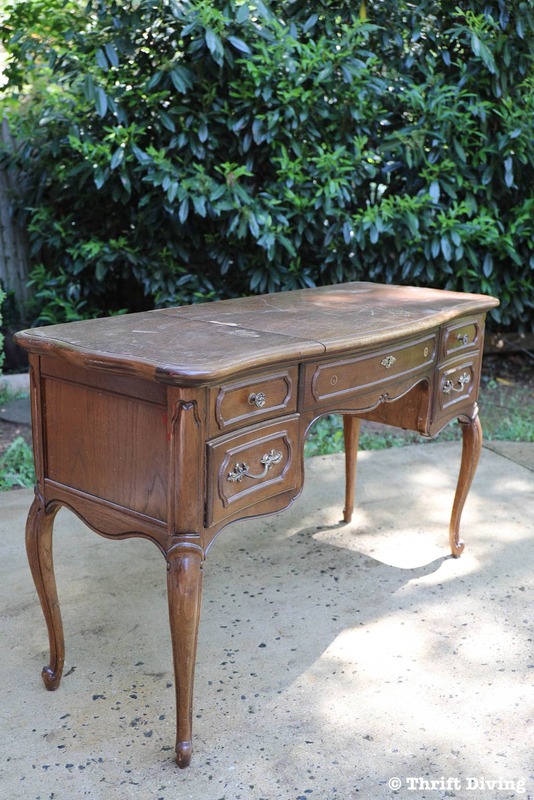 Just over a year ago, I scored this lovely little French Provincial vanity from the thrift store for–gasp!–$9.67. 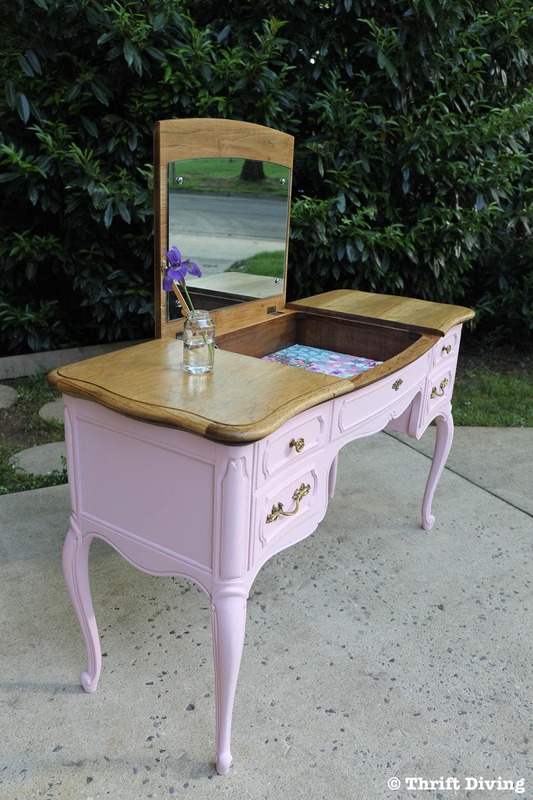 I struggled with what I wanted to do to it because I have learned how to love wood, after building my DIY bathroom vanity from scratch and knowing how expensive wood can be! So to paint this, seemed like it would have been a travesty. Yet, the top was all scratched up, the brown wasn’t doing it any justice, and it was taking up valuable real estate in my garage. 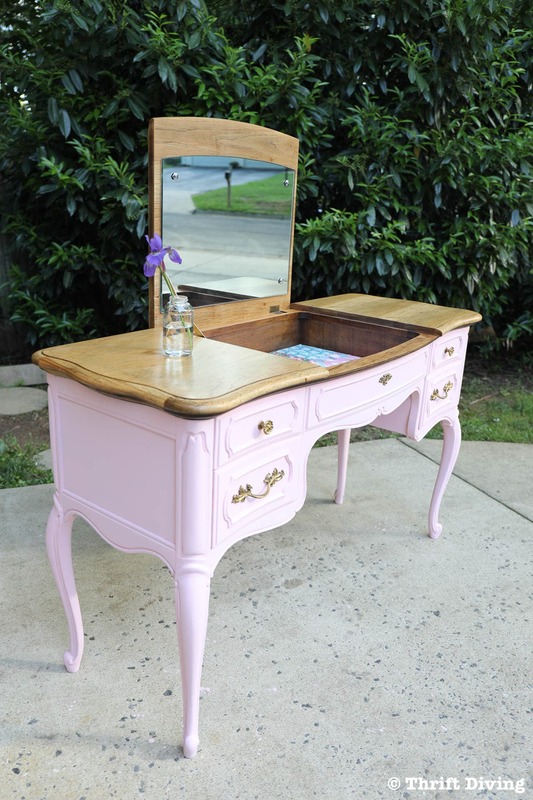 So I decided to give this French Provincial vanity the best of both worlds: a stripped top and a painted body with a custom-mixed baby pink chalked paint! 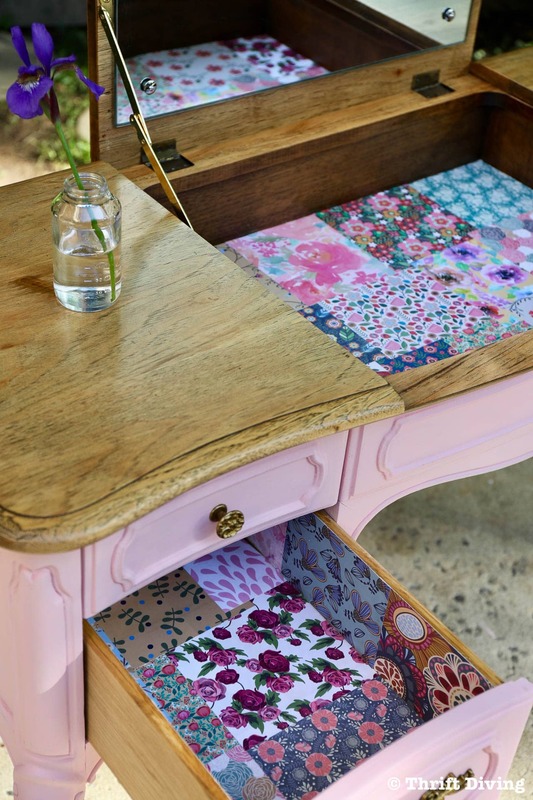 But it gets even better because, on a whim, I decided to do a fun patchwork decoupage with pretty scrapbook paper from A.C. Moore to line the drawers of this French Provincial vanity! Here are the materials that you’ll need for this project, which can be found at AC Moore. 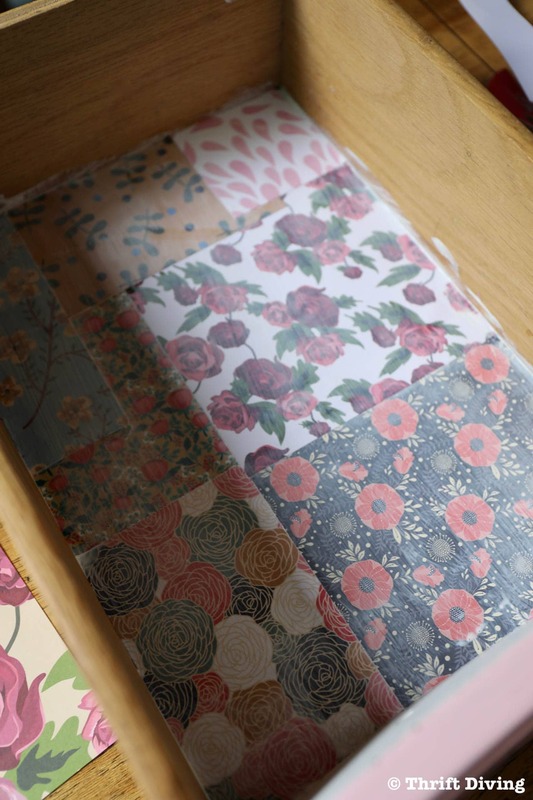 I had a whole stack of the Love Nicole scrapbook paper, supplied to me by AC Moore, but the sheets I was most interested in were the pretty vintage floral designs in the 6″ x 6″ size. These were perfect for layering. And while they were all different colors, the patterns all worked well together. I don’t know about you, but I love me some scrapbook paper. I find myself wanting to use all of it but never having enough craft projects to get through an entire pack. However, with this project, I was able to pull out all of my favorite sheets! (Psst! A.C. Moore recently partnered with Create and Craft to bring you the A.C. Moore Hour, airing every Wednesday at 11 AM Eastern time! Now you can tune in to your TV and regularly get great craft ideas. You can watch Create and Craft on DISH Network or stream online at createandcraft.com). 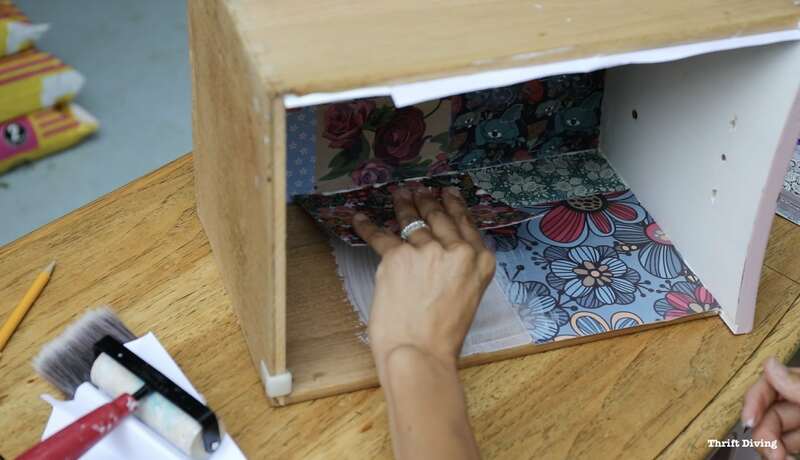 Before gluing and sealing the paper to the drawers, do a test fit to see what works well together. 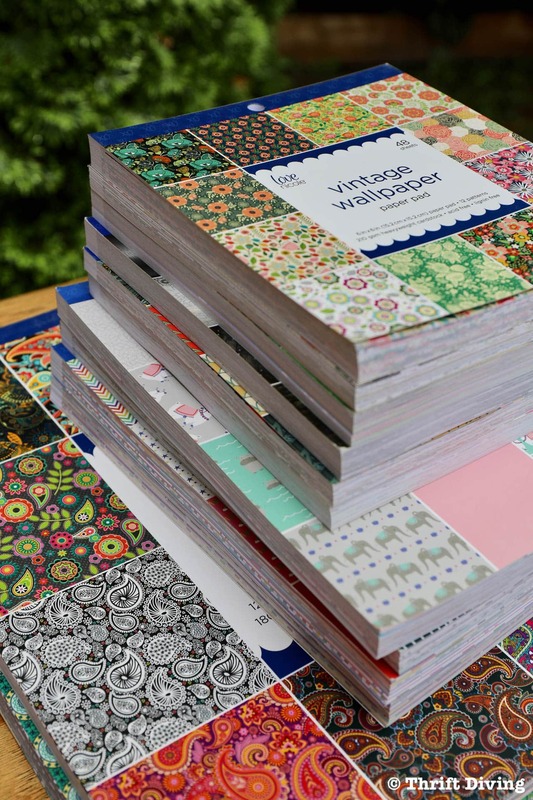 With the patchwork pattern of pretty papers, you can do whatever you want! I decided to do both the bottom and the sides of the drawers. My drawers had a slight curve, so I had to plan for which papers would be trimmed along the curve. 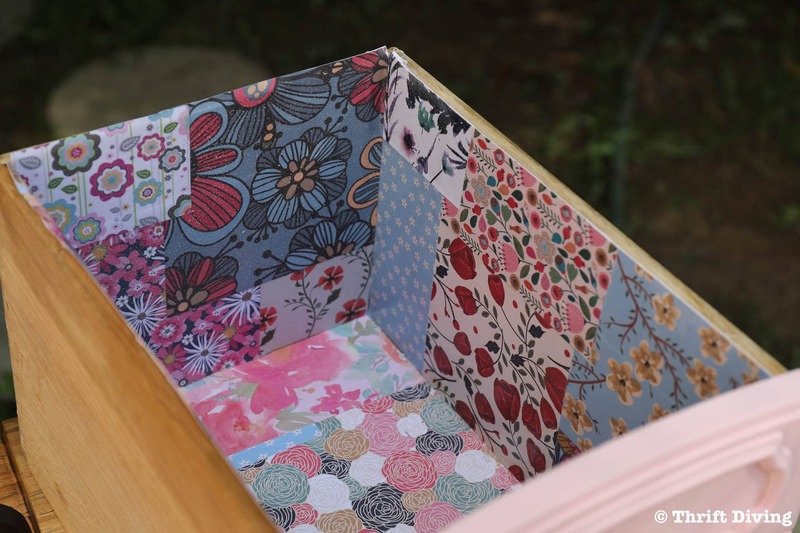 To account for the curve, I placed the square scrapbook paper in the drawer against the curve and pressed it, marking where the paper curved, then trimmed it with scissors. If your drawer is huge, work in sections at a time. Otherwise, your sealer will dry too quickly and you’ll waste it by having to apply more. Scrapbook paper is super thick, so don’t worry about applying too much sealer. It won’t seep through or ruin the paper. Place enough so that there will be good adhesion. 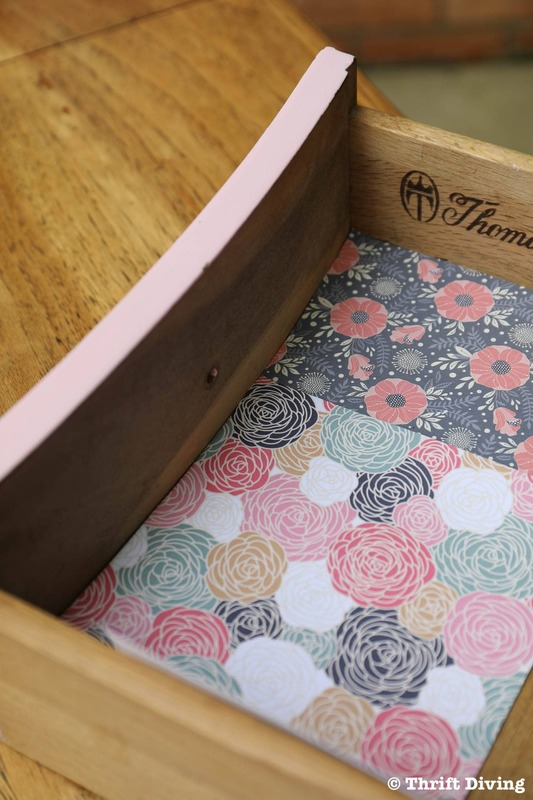 Apply the paper to the sides in the same way by adding a coat of sealer to the drawer, sealer to the back of the scrapbook paper, then use a brayer to remove any bubbles trapped underneath. Here’s the trick to making this turn out nice: be sure to extend the paper past the side of the edges about 1/4″! 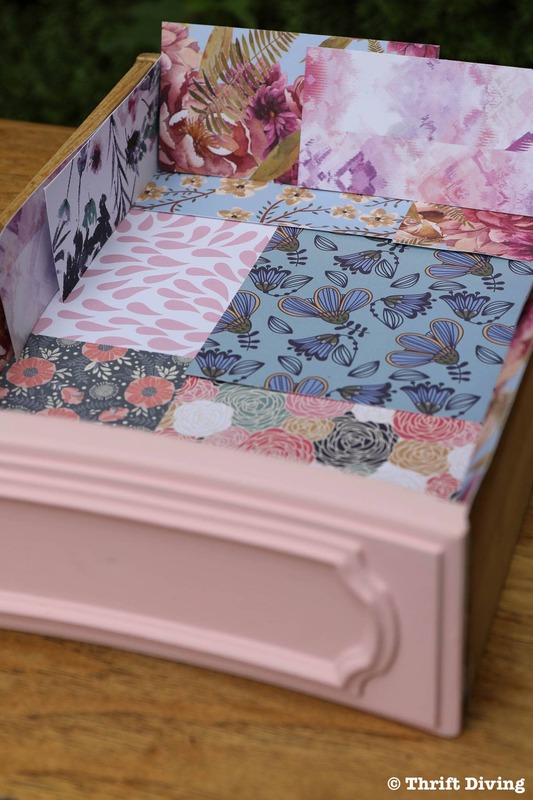 The reason why is because if you try to cut a precise piece of scrapbook paper to fit the dimensions of your drawer, you’ll likely be slightly off and you’ll waste paper re-cutting new pieces, or you’ll have sections that look a little uneven and bare along the edge. You want a crisp-looking fit, not a fit that looked like you cut the paper with your eyes closed. HA! Stick with me here, because I’ll show you a little trick to getting a good, exact fit! 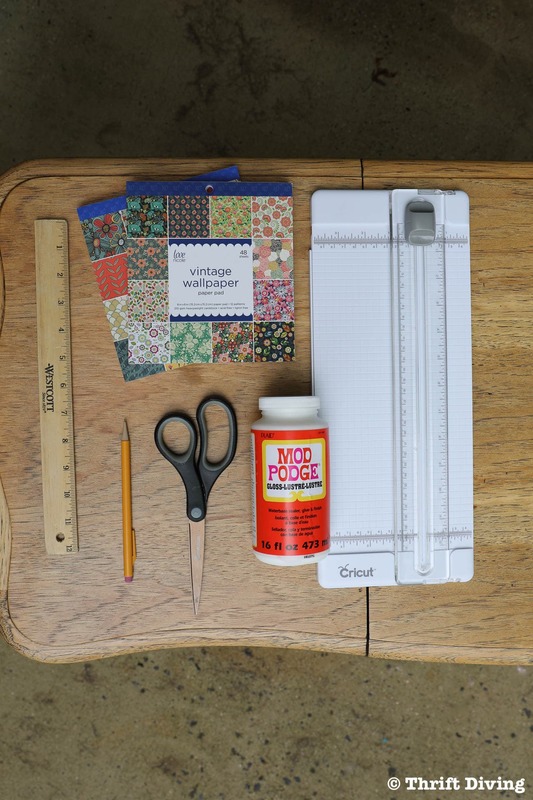 Next, add a coat of sealer on top of the scrapbook paper. This will help to seal it from any spills in your drawers. 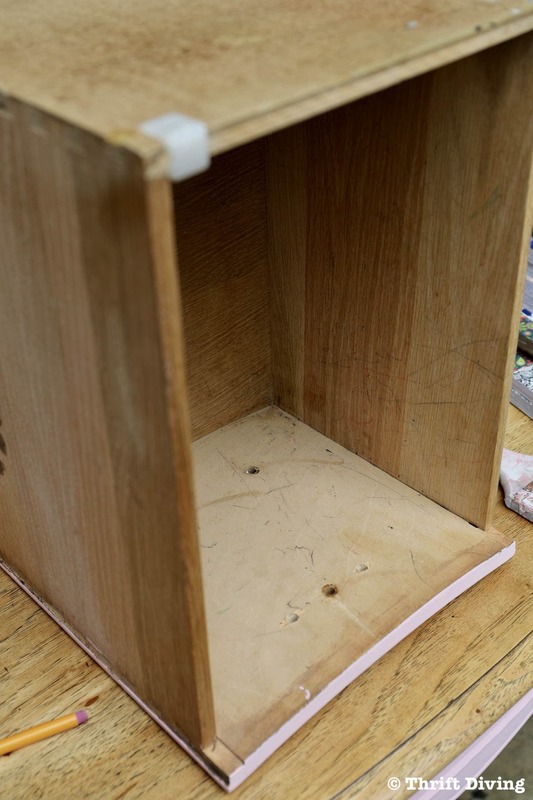 If you choose not to add paper to the sides, then skip that part and just paper the bottom and add a coat of sealer. This is where the magic happens to get the paper to fit nice and crisp to the edges. As I mentioned in Step 4, the paper should be longer than the edges of the drawer. If needed, trim it down with scissors, but leave about 1/4″ to 3/8″ extended past the edges. 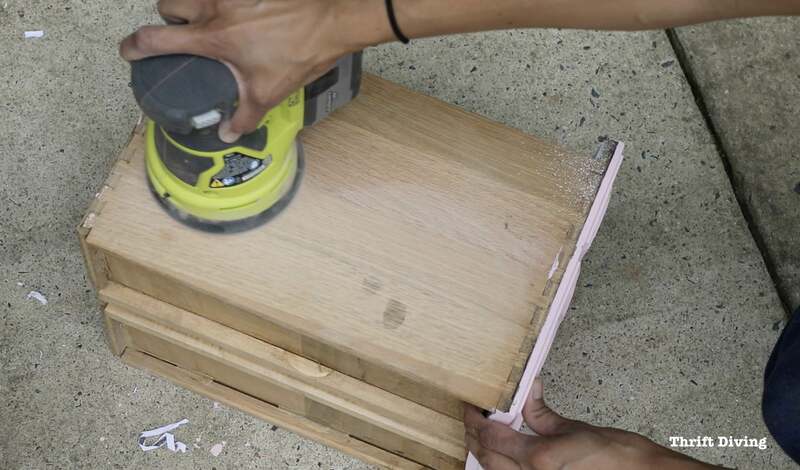 Once it dries a little, take some 220-grit sandpaper and sand the edges at an angle. But make sure you only sand in one direction. 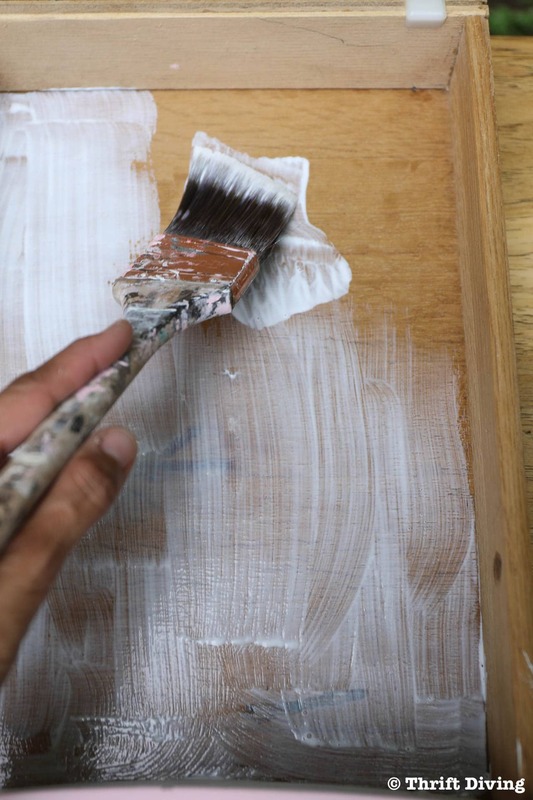 Don’t sand back and forth because it will loosen the paper at the edge. 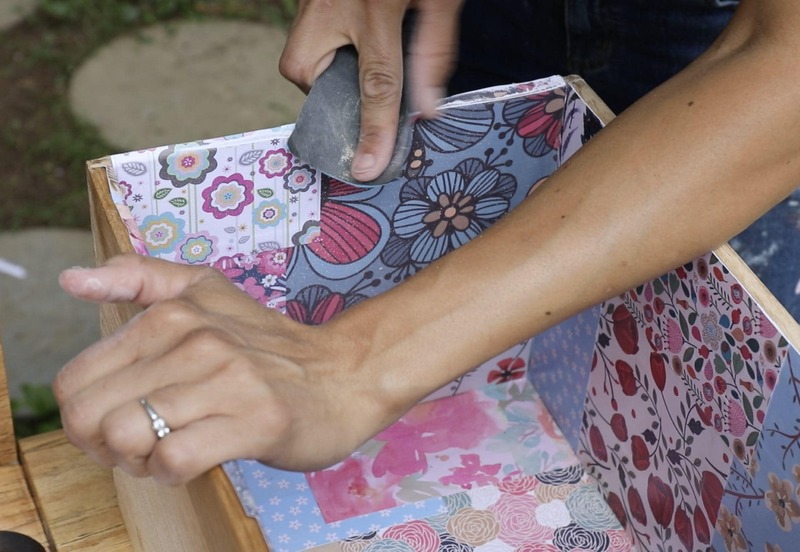 Sanding in one direction (towards you) at angle cuts the paper off right at the edge of the drawer, creating a perfect fit! Notice how crisp the paper is on the right side of the box? That side had been sanded. The back and other side hadn’t been sanded yet. The sanding method works great every time when gluing paper onto a surface with a sharp edge! 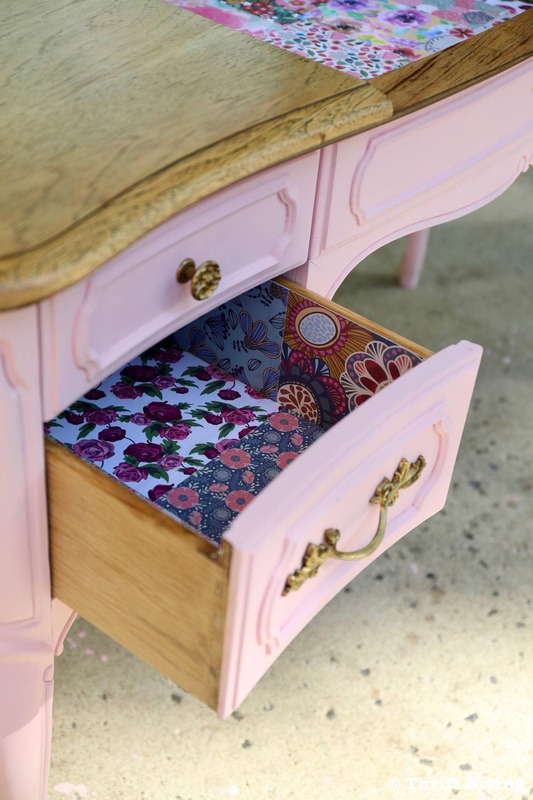 When the edges are all sanded and perfect, apply a light coat of sealer to the edges of the drawer, extending the sealer onto the edges of inside drawer, helping to re-seal any of the paper due to sanding. This is another little trick I like to use: when refinishing furniture, use an orbital sander to sand the sides of the boxes if you’re not painting them. 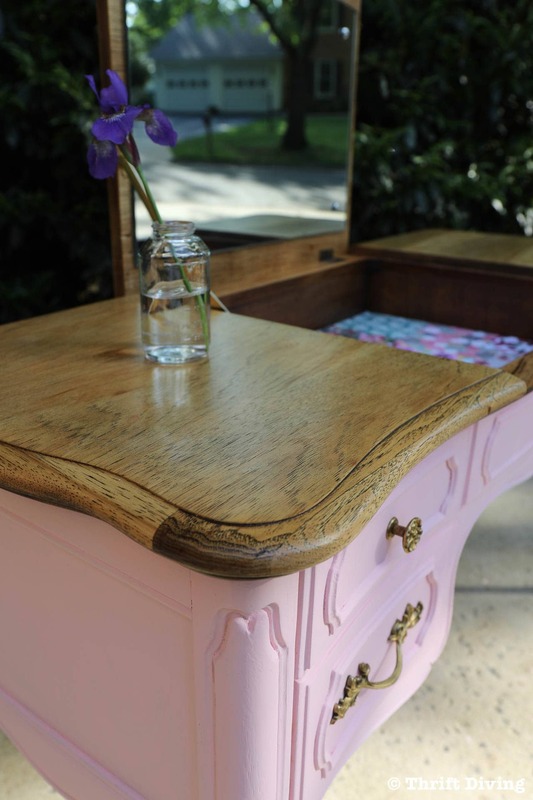 Usually, the drawers are all old, yellowed, worn out or stained. A quick swipe over with them with the sander helps to get out blotches and yellowing and makes the outside of the drawer boxes feel fresher! You can see here how it’s lightening the yellowed wood! 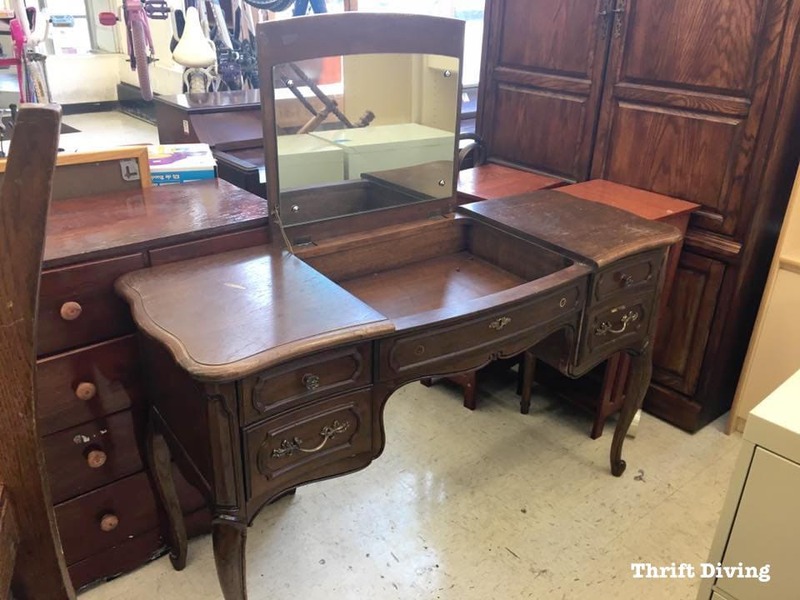 Let’s have another look at the drawers! 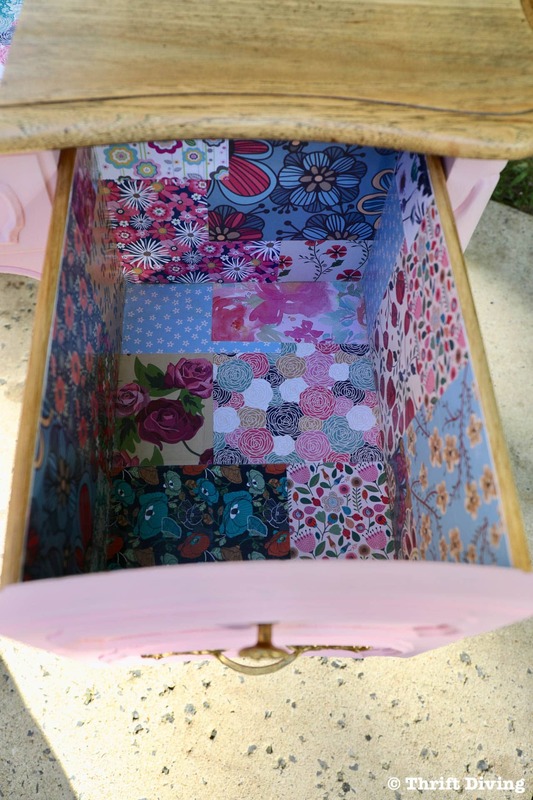 I loved the look of the patchwork scrapbook paper that I decided to use to line the inside of the French Provincial vanity, as well! 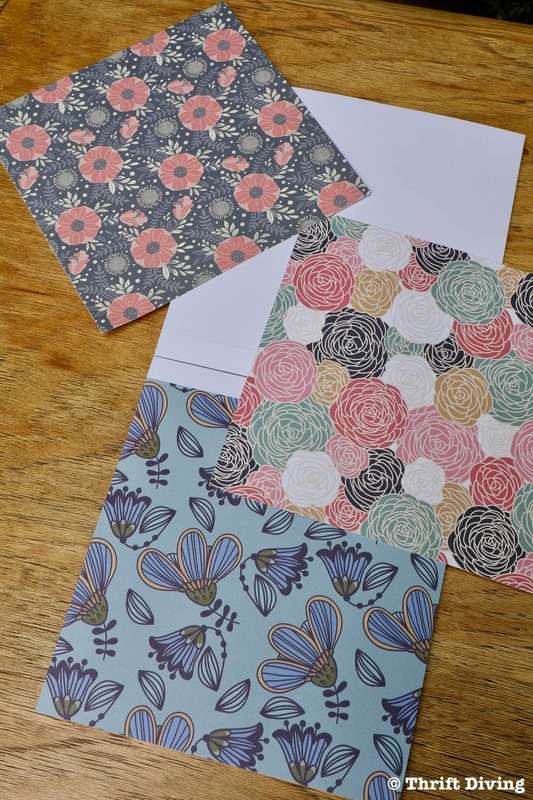 Check Out More Awesome Craft Projects With Scrapbook Paper! Enjoy this tutorial? Be sure to SAVE it! 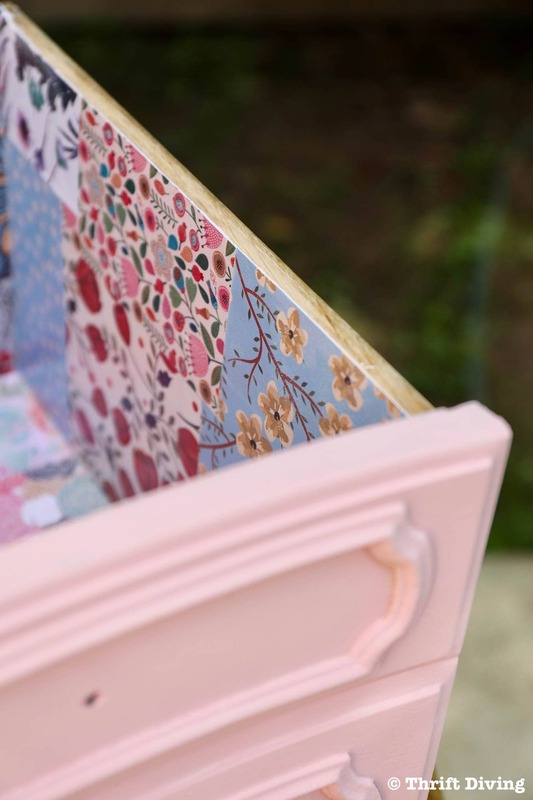 So what do you think of my thrifted French Provincial vanity makeover with drawers lined in pretty scrapbook paper?! 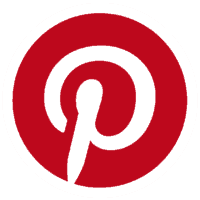 Visit your local A.C. Moore or find them online for more product information and inspiration! 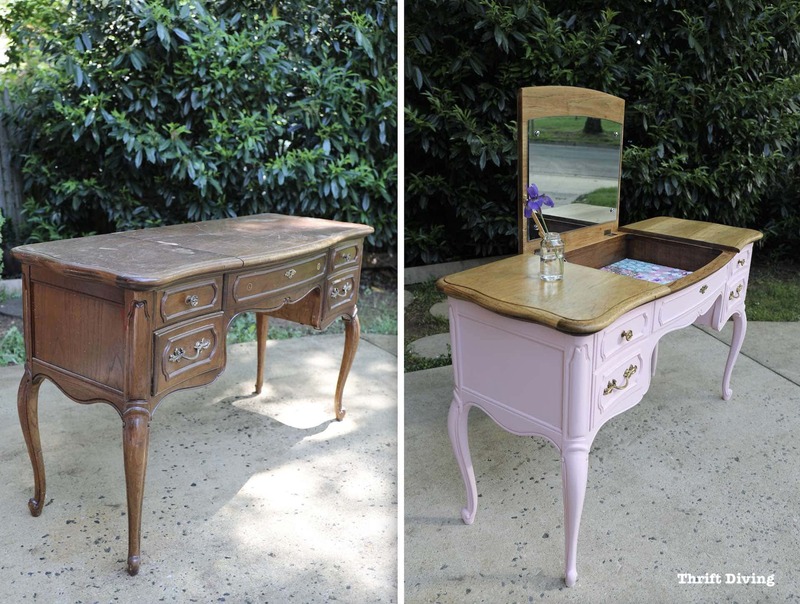 « French Provincial Vanity Makeover: BEFORE and AFTER With Paint and Scrapbook Paper! What a lovely way to finish off a lovely transformation! I love the paper you chose! 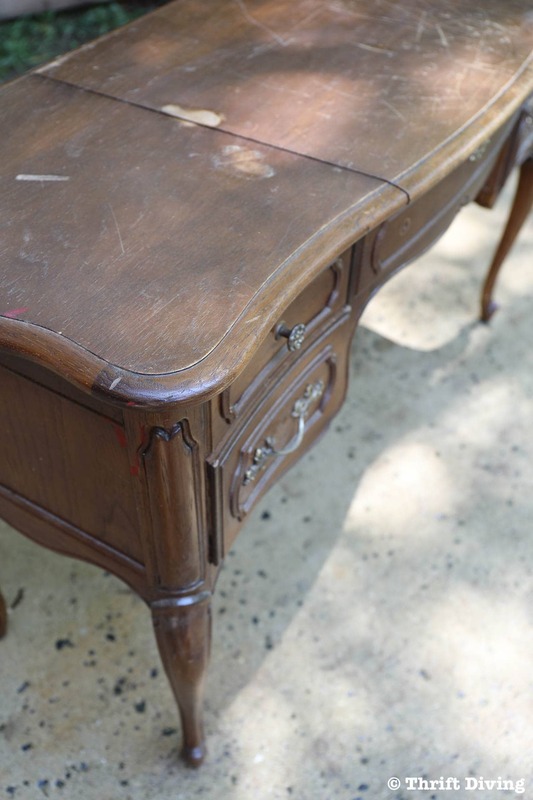 Thank you so much for sharing your fabulous how to with is over at Waste Not Wednesday!